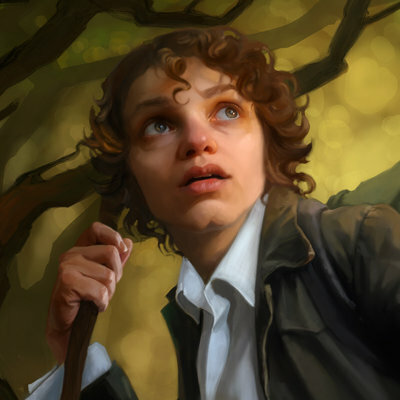 Meriadoc 'Merry' Brandybuck, called The Magnificent, was a Hobbit, the son of Saradoc Brandybuck. 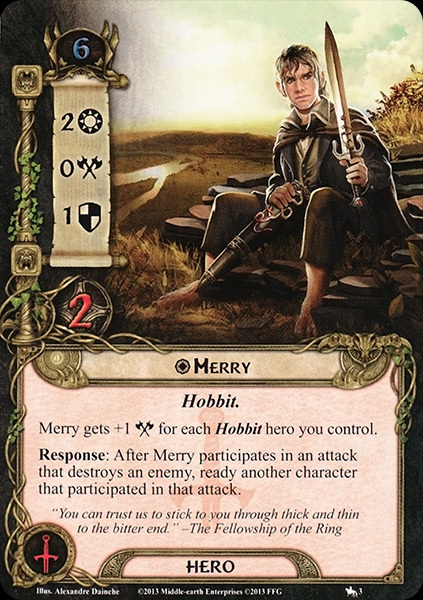 Merry (as he was often called), was the heir of the Brandybucks to Brandy Hall, and, after his participation to the War of the Ring, eventually became the Master there. Merry kept this knowledge private but was always suspicious. He was present with his family at Bilbo's Farewell Party and since Bilbo's disappearance, he believed that Frodo would soon follow. He shared his secrets with a group of Frodo's friends (namely Samwise Gamgee, Peregrin Took, Fredegar Bolger) the 'Conspirators'. Especially after April T.A. 3018 he noticed how Frodo was saying 'farewell' to his favorite places, selling Bag End to the Sackville-Bagginses, and secretive talks with Gandalf. All along, Sam Gamgee had been their 'chief investigator'. He heard Gandalf's instructions to Frodo for his departure, and warned his friends about it. At the gate of Moria, Gandalf commended Merry for being 'of all people' on the right track with the riddle (though this was accidental). His impetuosity in Moria was such that he nearly fell into an ancient well while running ahead with Pippin. When they reached Lothlórien, he was allowed to sleep in a telain with Frodo, Sam, Pippin and a few elven guards. He, as with the rest of the Company, walked blindfolded into the Woods of Lórien in a show of support for Gimli, who had to be blindfolded due to being a dwarf. While Pippin and Gandalf headed away to Minas Tirith, Merry stayed with Aragorn and the Rohirrim, developing a close friendship with King Théoden. Out of love for him, Merry offered the King his service, which Théoden warmly accepted. 'As a father you shall be to me', Merry said at that time, and Théoden responded 'For a little while'. Almost killed by the Black Breath, he and Éowyn were revived by Aragorn in the Houses of Healing. Because of his condition he was unable to take part in the Battle of the Morannon, but afterwards attended the burial of Théoden, at which he wept greatly. Upon his departure for the Shire, he was given a special horn by Éomer and Éowyn as a parting gift. After the King died, he travelled to Gondor with Pippin, where he was known as Master Perian. They both died several years later, and were laid in Rath Dínen. It was said that they upon King Elessar's death, their bodies were placed beside his. 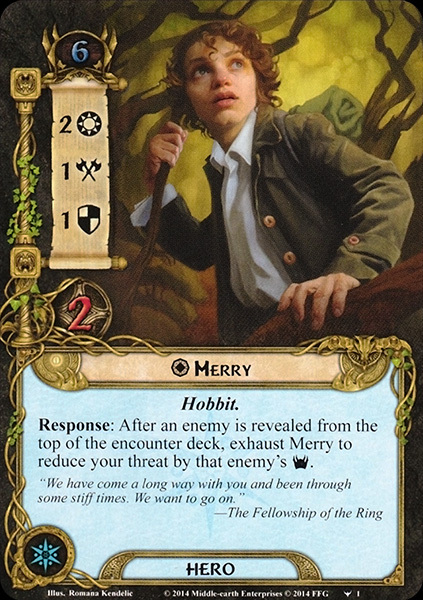 He can easily be recognized as a very sharp Hobbit, and his tone throughout The Lord of the Rings depicts him as practical, loyal, resourceful, and the best able to cope with the sudden happenings that drew him out of his peaceful home. He was also praised by Aragorn II as having a 'stout heart'. He was apparently much trusted by Frodo, who sent him along with Fatty Bolger to Crickhollow to prepare his newly-bought home. In the pre-publication manuscript of The Lord of the Rings, Merry's name was originally 'Marmaduke Brandybuck'. Meriadoc (also spelled Meriadek) was the legendary leader of a group of Welsh mercenaries who settled Armorica (modern Brittany) in the fourth century and founded the house of Rohan. Tolkien himself comments on the Celtic cast of this and other Buckland and Bree names that end in –ac, -ic, -oc. The name Meriadoc means 'Great Lord' in Welsh (from mawr='great' and udd='lord').